Rescuing, Rehabbing, Retraining and Rehoming Horses Since 1995. Celebrating our 20th Anniversary this year! Listen to Undercover Investigator 'Jack' discuss his role in the Bravo Packing Investigation on Howling Ridge Radio. Ellen Parker explains why on Howling Ridge Radio we will never see a Triple Crown Champion. Willie Gets His Ribbon!! Not bad for a 19 Year Old Quarterhorse! He claimed 2nd in a Halter Horse class & this was not a 'Senior' show! Please Visit Amanda Sorvino's Gray Dapple Thoroughbred Assisance Program! The greatest American Thoroughbred Filly who ever lived. Her barn name was 'Sophie' and she proved that girls can be 'Ruffians' too. 2015 will be the 40th anniversary of her death. Died: July 7, 1975 (age 3) at a veterinary hospital adjacent to Belmont Park, buried near the flagpole at Belmont. Please support our work through iGive. When the iGive link is clicked, a page is delivered to register and then a search can be made of all participating merchants. We are also an affiliate for . Funagain Games is a fantastic site with practically every game ever made - from all over the world!!! Games for all ages... Please give them a try! For more shopping options, please visit our shop. 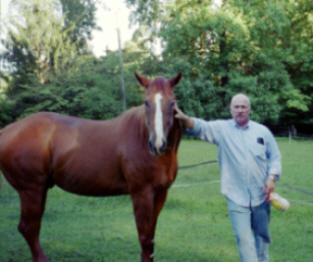 American Quarterhorse Champion 'Impressive' ~ Willie's sire. 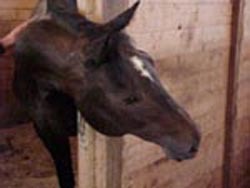 Manes & Tails Organization rescues Quarterhorses, however, we will not pay one thin dime to the American Quarterhorse Association due to their pro-slaughter position. 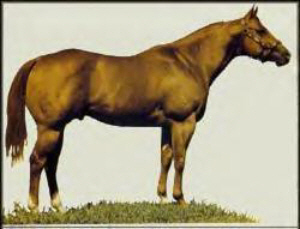 American Quarterhorses are the most overly bred and commonly slaughtered breed of horse in the United States. All of our American Quarterhorses have excellent bloodlines, but despite their breeding, they are lucky to be alive. 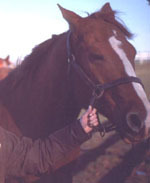 'Seattle Slew' son saved from slaughter in 1997. We are members of Great Non Profits. You can also support our work through Amazon Smile! We are members of the Horse Rescue Coalition. 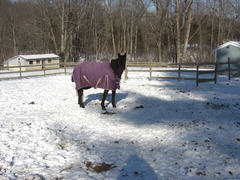 Pastel is a 15 year old Thoroughbred mare who suffered an ankle injury at the age of 3. Her owner paid for her surgery, however, the party who was caring for her after her injury left her in her stall for two years! We were told that Pastel would only be 'pasture sound.' Not so. Ms. Pastel, who won 43K at the track, is now galloping around every day in the big field. 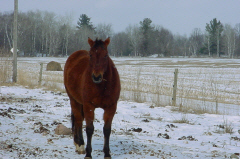 This lovely 17 year old Canadian bred Thoroughbred mare is a liver chestnut color, which is rare for Thoroughbreds. She is very sweet, but has a lot of attitude! Willow is available to experienced Dressage Riders ONLY who understand that she has been abused. Films of All Eleven Triple Crown Winners! The Manes & Tails Organization was incorporated in June of 2004. We rescue slaughter bound Thoroughbreds, Quarterhorses and Paints and free lease them. Among those we have rescued are a son of 'Seattle Slew', a grandson of 'Secretariat', a great granddaughter of 'Secretariat', a son of Quarterhorse champion 'Impressive', a 'Dash for Cash' daughter and granddaughter, and a 'Sahlih' son, and two great granddaugthters of 'Mr. Prospector.' We never sell our horses; this enables us to guarantee them wonderful homes for the duration of their lives. Every horse we rescue from slaughter continues to contribute to the economy. 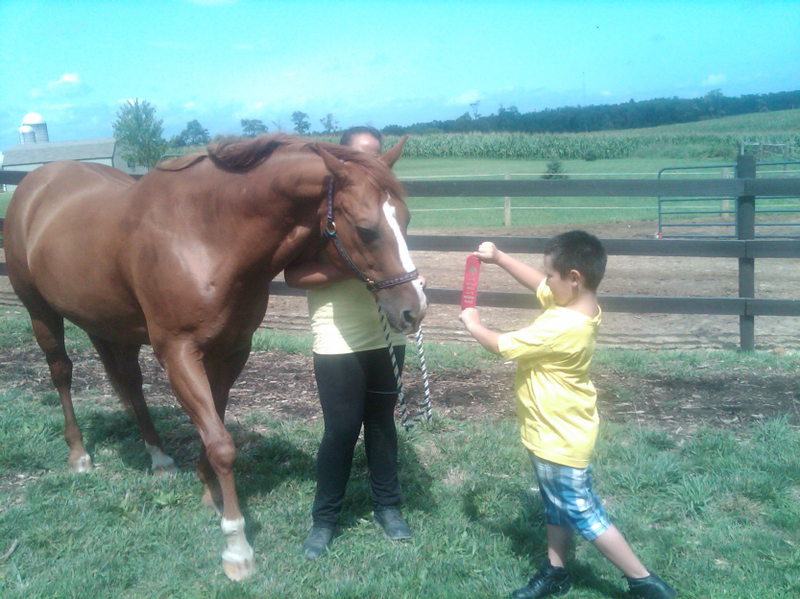 We have horses ranging in age from 5 years old to 24 years old. Our Board Member Dr. Lester Friedlander, DVM is a former USDA Chief Inspector. Dr. Friedlander is now a vegetarian. Listen to what he has to say here. The NYPD is the oldest Mounted Police Unit in the United States and they currently have over 90 horses on their force. NYPD MPU has over 55 horses in retirement. Manes and Tails Organization has committed to adopting a retired NYPD MPU horse! Manes & Tails' 'Willie' & NYPD MPU Officer John B. Reilly, Jr. Some brief notes of interest: the Baltimore force uses only Draft horses rescued from the Amish, the Lexington, KY force has two Percheron Appendixes who are brothers (in addition to eight other horses on their force), and the Hoboken, NJ force has Standardbreds and one Appendix. View the video of the Hoboken, New Jersey Mounted Police Force here. View the video of the Lexington, Kentucky Mounted Police Force here. 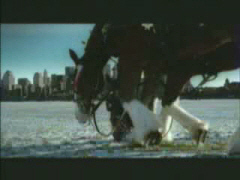 The Anhueser Busch Clydesdales Pay Tribute to New York City. This commercial aired once one year to the day of the destruction of the World Trade Center on 9/11/01. Please scroll down to learn more about the Anhueser Busch Clydesdales. What About the Wild Horses & Burros? 'Okay Renee' aka 'Maddie' is a great granddaughter of 'Secretariat' and Callie's half sister. She is 14 years old and was rescued by Manes & Tails Organization in conjunction with Another Chance For Horses. 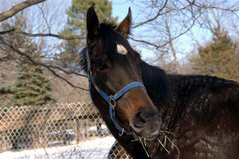 Maddie was in quarantine at Hidden Pearl Farm in Bethal, PA. 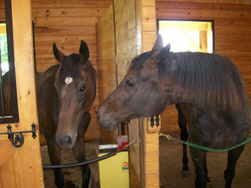 Proprietor Nick Edmunds breeds, trains, sells and shows beautiful warmblood horses. Visit the site for more information about Hidden Pearl Farm. Tess has been free leased by Jessica Benson. 'Willie' is an 'Impressive' son. Willie - aka 'Cause I'm Impressive'.